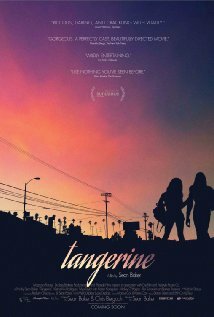 Movie Review: Under the direction of Sean Baker (“Starlet”), who wrote once again with Chris Bergoch, the active “Tangerine”, executive produced by the Duplass brothers and entirely shot on Apple iPhones adapted with anamorphic lenses, absorbs our attention during its 88 minutes. The story starts focusing on the transgender prostitute Sin-Dee (Kitana Kiki Rodriguez), returned to the busy streets of the sunny Tinseltown on Christmas Eve, after spending 28 days in prison. Her best friend, and also transgender, Alexandra (Mya Taylor), is the only one who welcomed her, and the occasion should deserve celebration. However, when Sin-Dee is told that her pimp boyfriend, Chester (James Ransone), was cheating on her with a female prostitute called Dinah (Mickey O’Hagan), she starts an unruly searching for the couple in every possible spot of the ‘hood. We set off into a wacky trip without precedents, packed with lots of personal confrontations, funny situations, and some lamentable realities. Every character is genuinely unique and some of them gradually start gaining preponderance in the story – besides the strenuous Sin-Dee, who talks interminably with a terrific wild accent, we have: Ramzik (Karren Karagulian), a married Armenian cab driver and frequent client of the male ‘girls’, whose secret is discovered by his nagging mother-in-law; the super dressed-up, Alexandra, who pays from her own pocket to sing at minor local clubs; and of course, the manipulative Chester whose brief appearance provides the funniest moments of the film. “Tangerine” is insanely raw and only for once felt slightly machinated - when Alexandra hauls a guy along the street after his refusal to pay her services. Newcomers Rodriguez and Taylor were a revelation; Mr. Baker’s regulars, O’Hagan and Karagulian, were flawless; and Ranson was a priceless add. Sean Baker’s best film to date, also flares with an articulated sound design.